Unfortunately this made for money movie really fails even though it stars the delightful Jamie Kennedy. 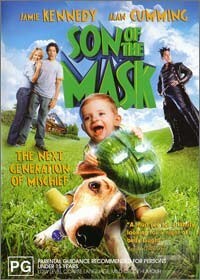 When Tim Avery's child somehow finds the mask of Loki, the world had better watch out in this light-hearted kids movie that has a few laughs but is more for the smaller viewers. Presented in an aspect ratio of 16:9 widescreen with Dolby Digital 5.1 with a plethora of special features from commentary to the making of featurette. Great stuff for kids!